ATG Hosts Fueling Station | Bike to Work Day 2017 - Alliance Transportation Group, Inc.
ATG is sponsoring Bike to Work Day 2017 and will be at Kramer Station – 2427 ½ Kramer Lane providing morning munchies! Don’t drive alone to work, come ride with us! Kick-start your Friday fun and join Bike Austin and Alliance for B2WD! 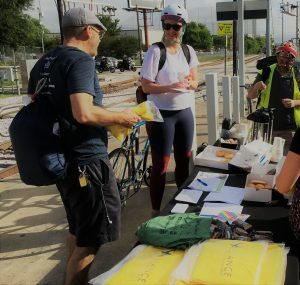 Like Alliance, Bike Austin knows how to throw a good party and this year Alliance will be among the 40 Fueling Stations with more free coffee, snacks and swag than ever. This year Bike Austin will throw their staple after-party at Google Fiber! Pick up a Bicycle Passport at Alliance’s Fueling Station @ Kramer ( or any morning fueling station), and collect stamps at each subsequent station you visit. Your passport gets you a free beer at the after-party, and each stamp you collect enters you into a door prize drawing, featuring prizes from their sponsors! FREE food, FREE beer, FREE swag bags, and NEW friends! Need we say more?! It is a fun way to start your day! Since you avoid all traffic, you can sleep in everyday, not only on weekends! You make new friends at every stoplight, you never ride alone. It’s healthy, get your morning work out in! take advantage of the beautiful Texas weather! Trust us, Swedes envy us. It is an active way to reduce your carbon footprint, reduce traffic congestion, and can save you gas money. A study published by the San Diego Association of Governments showed that 1 out of 5 people who participated in a Bike to Work Day event became regular bike commuters. 7:00AM – 9:30AM – Visit morning “fueling stations” – throughout Austin for some free coffee, swag bag and snacks. Don’t forget to collect stamps! 7:30-8:00am – Bike trains (aka group rides) help you get to your destination. Visit our Bike Trains page for a full list of ride departure times. 8:00am – Press conference with local elected leaders at the City Hall Fueling Station. 5:00 – 7:00pm – Bike Home From Work Day Party at Google Fiber. For fifty-five years, National Bike Month has been the perfect time for new or returning riders to get back on the saddle and ride their bike to work. Originally the Cycle Trade Association called the month American Bike Month but in 1956 it evolved to Bike Month. Along with the name change, Bike Month became more about promoting cycling and safe bicycling, not just selling bicycles. History per the League of American Bicyclists. In Austin, Bike to Work Day has traditionally been organized by the Austin Cycling Association (now Bike Austin) and takes place on the third Friday in May. Bike Austin is your voice for better bicycling in Austin. We envision Central Texas as a place where everyone recognizes and embraces the benefits of cycling, whether they ride or not, and where cycling is a common aspect of daily life for everyone. Central Texas has a comprehensive bicycle network enabling people in the region to comfortably, safely and efficiently use a bike for transportation and recreation. Bicycling supports the community as a whole by: increasing roadway capacity and user mobility; strengthening the economy and household affordability; improving the environment; and promoting an active, healthy lifestyle.